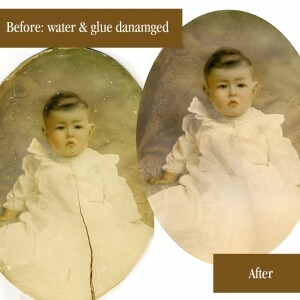 Make your memories perfect by giving life to your damaged photos that are cracked, scratched, faded and damaged by water or other elements. 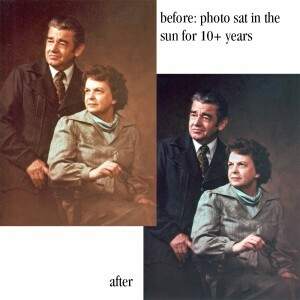 Three levels of photo repair to fit all your needs. Flat fee, no guessing how much restoration will cost you in the end. Need something special? Contact me. Contact me and see your photos in a new light. 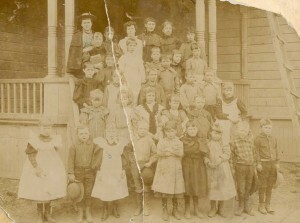 Medium damaged photos should not have cracks or major facial damage. Faded and lightly scratched photos are in this category. Highly damaged photos may have small cracks, scratches and/or damage by water or other elements. (see photos for examples) No significant facial damage. 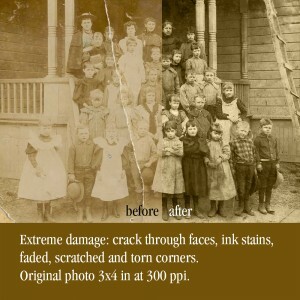 Extremey damaged photos are cracked, scratched and damaged by water or other elements. (see photos for examples) Usually with facial damage. Before bringing your memory back to life, I will evaluate your photo and let you know if it fits the criteria for “highly damaged” or if it fits into the “medium” or “extreme” categories. 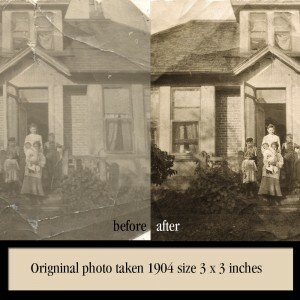 Sadly there are some photos that are so severely damaged that they cannot be reasonably fixed. If this is the case, I will discuss with you what can be repaired and let you decide if you rather have a full refund or try for a partial fix. Please contact me if you are unsure which service to choose. I’ll be happy to do a quick evaluation. If applicable please included a Photographer’s release. Once I receive and evaluate your scan, I will let you know when to expect a watermarked proof for your approval or further instructions. (usually 1-2 business days) After you approve your photo, I will send your final unmarked file photo via email.